Monk: If you’ve eaten some of Charlotte’s best barbecue in the past decade, chances are it is in some way owed to Dan “Boone” Gibson. Along with his friend John “JD” Duncan, he helped start the original Mac’s Speed Shop on South Blvd (which in my opinion has gone downhill since they both left) in 2005 as well as more recently a Barbecue Bros favorite Queen City Q in 2012. 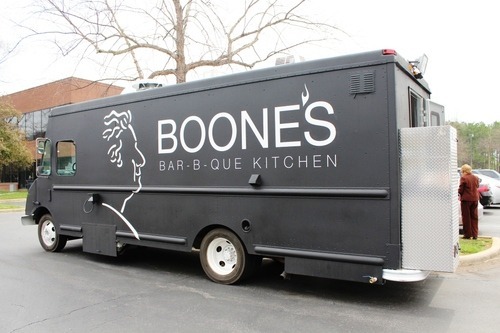 Now, he has struck out on his own and started Boone’s Bar-B-Que Kitchen, a food truck that has popped up in various south Charlotte office parks in recent months. 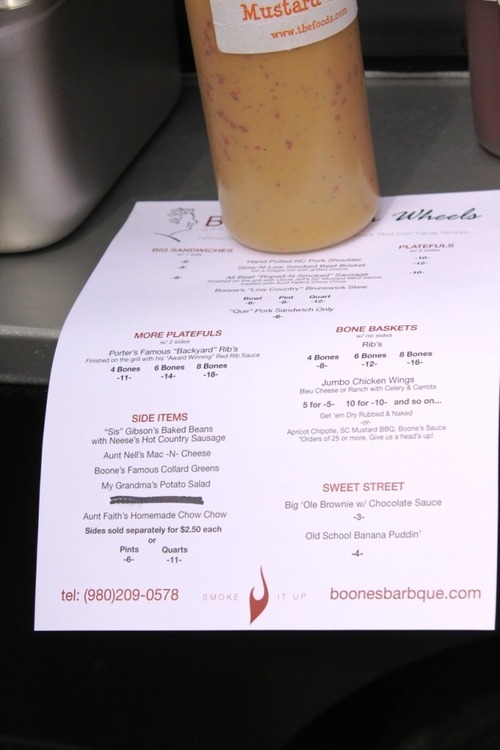 Boone’s family recipes, which don’t necessarily follow eastern or piedmont barbecue traditions, were the basis for Queen City Q and remain the basis for his food truck. So while they do have an eastern NC vinegar sauce, a SC mustard sauce, and a rib sauce (called “PoPo,” the same name used at Queen City Q), the signature pork sauce is apparently a mixture of the rib and mustard sauces. While it is referred to as a “Piedmont” sauce, you wouldn’t find anything like it at Lexington #1. The family influence is also evident in the names of the sides (again, some of which share names with sides at Queen City Q) – Sis Gibson’s baked beans with Neese’s, Aunt Nell’s mac-n-cheese, Aunt Faith’s homemade chow chow, etc. You can choose either a “big sandwich” with one side or a “plateful” which comes with two. 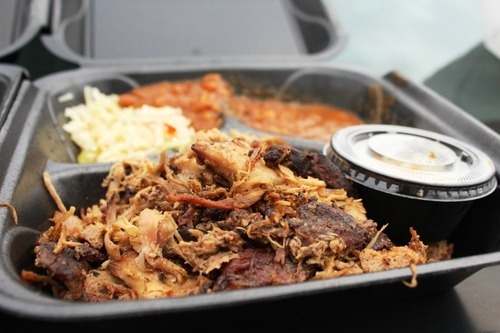 I ordered the hand-pulled NC pork shoulder plateful with baked beans and chow chow. And since it would likely be a while until I made it out again, I decided I also wanted to try the brisket and sausage. Thankfully, they obliged me with a couple of slices and a link for $6 extra. 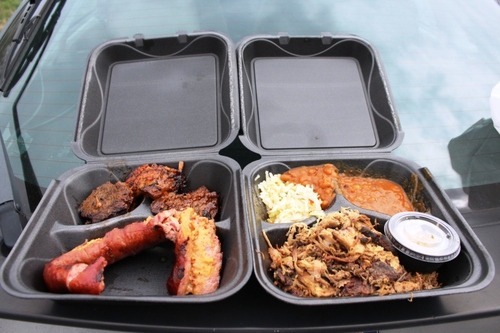 After a bit of a wait, the lady who took my order handed me two heavy boxes packed pretty well with smoked meat. I opened the boxes to a very strong waft of smoke, which was heavenly. The pork was moist, tender, and smokey and pulled with large chunks of bark. It. Was. Great. I mean, really, really great. I tried the Piedmont sauce with it but really, the meat didn’t need it at all. The brisket was smokey, sauced, and had a good tug to it. The sausage link was slathered with the mustard sauce and it complemented it well. Both were really good. So at this point, Boone is 3-for-3. The beans and chow chow were reminiscent of the same dishes from Queen City Q, which I liked back then and liked on this day. There was also a small side of chow chow that I didn’t realize came with the pork (I wouldn’t have ordered a side of it if I knew). Some minor nitpicks – the sweet tea wasn’t sweet at all and the ordering process could have been more efficient. A few folks who had ordered before I got there grumbled about the wait, and mine took maybe 7-8 minutes. 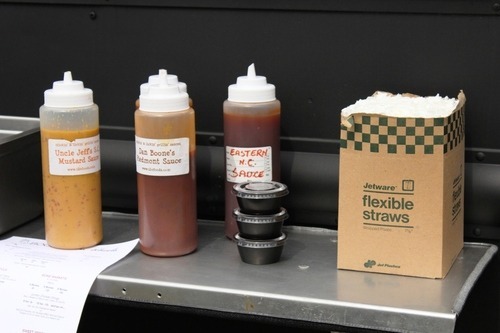 Also, some hush puppies on the menu would have been nice – although logistically that might be tough in a food truck. Rudy: In Texas I have seen some great barbecue come from food trucks (i.e. Franklin’s started in a truck). But the problem I have with them is, where is the pit and how are they cooking the meat? The two best barbecue trucks in Austin have permanent locations, so they have their pits right there, but what about this one that drives around between locations? Do they cook it at a pit located at one of their other restaurants and then just serve it from the truck? I’ll be interested to hear Speedy’s review to see if Boone’s stands up. 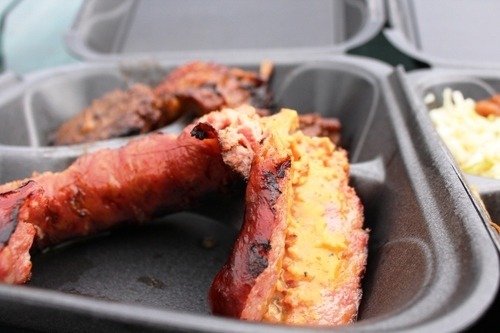 Speedy: Speaking of Midwood Smokehouse, I think it’s time to go re-review it. 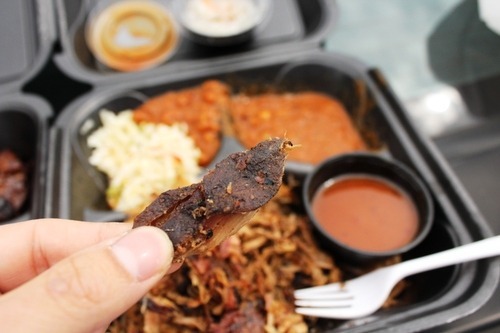 Our original review is nearly two years old, and very early in our lives as Barbecue Bros (I mean we ordered smoked turkey for Chrissakes). I think I’ve grown to love it even more since that time. 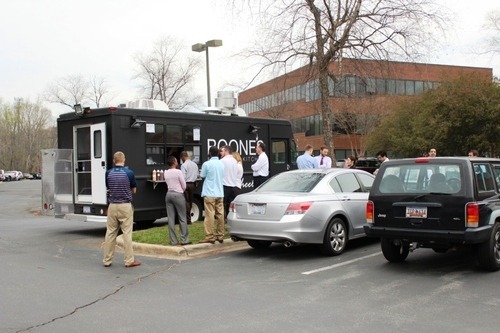 Out of respect for our bro-ness, I have to respect this review and believe that Boone’s is something special, but I will be on the lookout for this truck in order to verify the review sample some of that ‘cue. Monk: That’s fair, and maybe if you are ever in Charlotte during the week and can take some time off for lunch we can check it out. 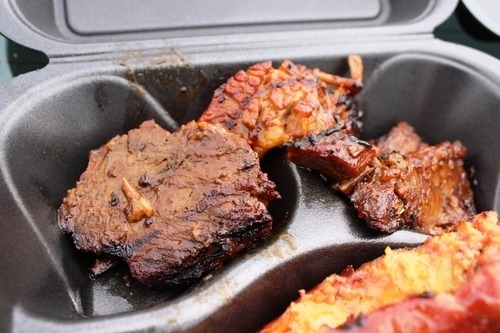 As for Midwood Smokehouse, I’ve been thinking a re-review of it was in order anyways. I mean, c’mon – smoked turkey!?!? Yeesh.